There’s no hiding the fact that Motorola is on the rampage of getting quite a few Android devices out to market, but information regarding the Motorola DROID 3 and DROID X2 have been relatively skimp thus far. Even though we’re still waiting for an official confirmation from Big Red about their existence, Best Buy’s internal system provide us some additional pieces of information. 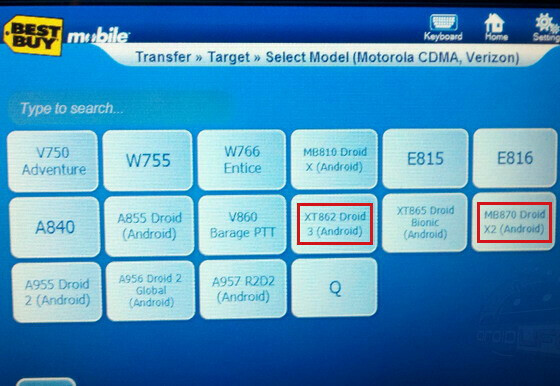 Specifically, their data transfer system has been recently updated, and looking at the photo below, we find both the Motorola DROID 3 and DROID X2 available as selections – with respective model numbers of XT862 and MB870. Now that the two are showing up in their Cellebrite system, it could potentially mean that an imminent launch could be on the horizon – then again, it makes you wonder Verizon’s strategy. Specifically, we’re itching to know if the two will launch close to the same time, or rather, be spaced apart to sufficiently maximize sales. naturally being that the Droid 3 will probably be the next phone i get i hope it comes out sooner rather than later which looks to be the case with the amount of news surrounding it lately. 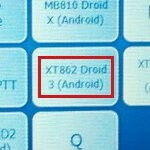 it will have a duel core processor, the proof lies in a video of the Droid X2 boot up sequence which shows that it's powered by "Duel Core Technology"
My sentiments exactly, the specs they have for the X^2 sound like a crap iphone 3g to 3GS upgrade, utterly pointless and just to make money. The specs are barely any better than the X and no front cam? What's the point of that? Only more RAM and a qHD LCD and a slight bump in clock speed, sounds like a waste of time. I would prefer a lower power screen with same or better visuals, 2.3 out of the box a fully realized Single Core CPU or second Gen Single Core, keep the same case style just make less on each end, no 4G. Why? Because that would be shooting themselves in the foot, you can have only one Flagship for 4G in the company, the Bionic or Targa is supposed to be that, can't have the 2nd edition X usurping that. Notice Motorola didn't do that with the Droid 2, the X was the flagship, I expect Motorola to do it with each successive generation. Flagship is replaced by a newer model and the current flagship gets updated but will not outdo the new Flagship. It has the same size display, but it's QHD=definite resolution upgrade. I'm hoping for Gingerbread/New Blur too. If it doesn't have it, it will probably be an update released REALLY soon after. It's a Dual Core. I disagree with 4G. The BIONIC will already be one; it's good to offer a 3G top of the line smartphone as well, so customers in 3G only areas feel that they are being thought of too. On a Verizon 3G only phone, I think a front facing camera is near useless. It's slow enough that video chat would be stuttery at best. Video streaming is best reserved for wifi or 4G. It still has the soft touch coating. The X is what I would now consider a mid grade device, which is why it doesn't need a total makeover. It's for this reason that I don't compare Apple's lack of innovation in design to Motorola's, because they're still coming out with more kickass phones while letting their previous top of the line phones fill out a mid grade category. Right now the iPhone's mid grade category is being matched by phones as low end as the frickin' Bravo. i agree Sniggly but i believe a FF camera would've been a nice addition, it can't be so bad after all the iPhone 4 has a FF camera and it's a 3G phone. And it's a gimmick on the iPhone 4. I mean, yes, it'd be nice, but it's not necessary and would probably necessitate an excessive redesign of the entire top half of the phone. For something that's supposed to only be a minor refresh in order to give the 3G folks their own high end smartphone, it's a waste of time and money, both of which Moto Mobility have very little of to waste. well a lot of people seem to appreciate their gimmick and the Droid Incredible 2 has one as well and these two phones will be direct competitors and i don't think it'd be too hard to fit a FF Camera in the bulging area of the phone. why make millions of phones with nearly the same functionality as it's predecessor when it would be nearly justifiable to just buy the 4G handset just to use on 3G for the addition of a FF camera or what have you?